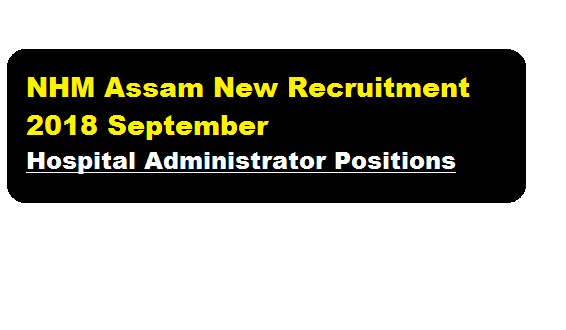 In this section, we will discuss in detail about Recruitment of Hospital Administrator posts under NHM Assam Recruitment 2018 September with all the details and requirement. Candidates mus have done Masters Degree / Post Graduate in Hospital Management / Hospital Administration or equivalent from Govt. recognized institution. BRIEF DUTIES: He/She will be responsible for assisting the Superintendent of the Medical College Hospital / District Hospital in implementation of the activities AYUSHMAN BHARAT besides assisting in general administration matters. Salary : Negotiable for suitable candidates as per market rates & last drawn remuneration. min. Candidates will have to apply through online mode.Candidates can apply online in the NHM, Assam website: https://nhm.assam.gov.in . Online application will be received till 10 September 2018. Date of Publication of shortlisted candidates for interview 14th September 2018. 1/ Only short listed candidates will be called for interview for which no TA/DA will be paid. 2/ List of shortlisted candidates will be published in the website https://nhm.assam.gov.in before the interview. 3/ No call letters will be sent for attending the interview. The suitable candidates from Assam working outside the state are encouraged to apply. 4/ The non-Assam resident candidates will have the option for Skype Interview.